Pour the warm water into the bottom of a large bowl and sprinkle the yeast and the sugar on top to activate the yeast. Mix together (a fork will work), and let the mixture sit for 10 minutes until foamy. In the bowl of a stand mixer fitted with the paddle attachment, combine the buttermilk, butter, honey, and yeast mixture whisking it all together vigorously. Add the salt and 2 cups of flour. Switch to a dough hook, and mix to combine. Using 1/2 cup at a time, add the remaining flour ( ended up using almost 7 cups of flour). The amount is going to vary (humidity really affects this), so just relax and go with it! You are looking for a shaggy dough at first. After about 4 minutes of kneading with the dough hook, the dough should look smooth and springy, and it should spring back when pressed. It will also pull away from the sides of the bowl into a ball. Transfer dough to a greased bowl, turning the dough to grease all sides of it. Cover bowl with plastic wrap and set aside at room temperature until it doubles, about 1 to 1.5 hours. Again, ths will vary greatly by the room temperature in your kitchen, so keep an eye on the dough. Thoroughly grease to 9-by-5-inch loaf pans. Thirty minutes before baking, preheat oven to 375 F.
Turn dough out onto a floured board and divide. Form each ball into a standard loaf (for tips on how to do this, see here, and here, and here.) Cover lightly with plastic wrap, and allow loaves to rise until doubled in bulk, about 30 to 45 minutes. Place the pans in the center of the oven, and bake for about 45 minutes. After the first 20 minutes of baking, rotate the pans 180 degrees, and continue baking until the loaves are golden brown, and they pull away from the sides of the pan. Remove the loaves immediately from the pans and allow to cool completely on a cooling rack before slicing. What a gorgeous color on that loaf! It does look like it would be an excellent toast or sandwich bread. Ah ha! Another use for buttermilk that I have laying around all too often. And any bread with honey in it gets my vote. It looks amazing! What the beautiful shiny loaves! 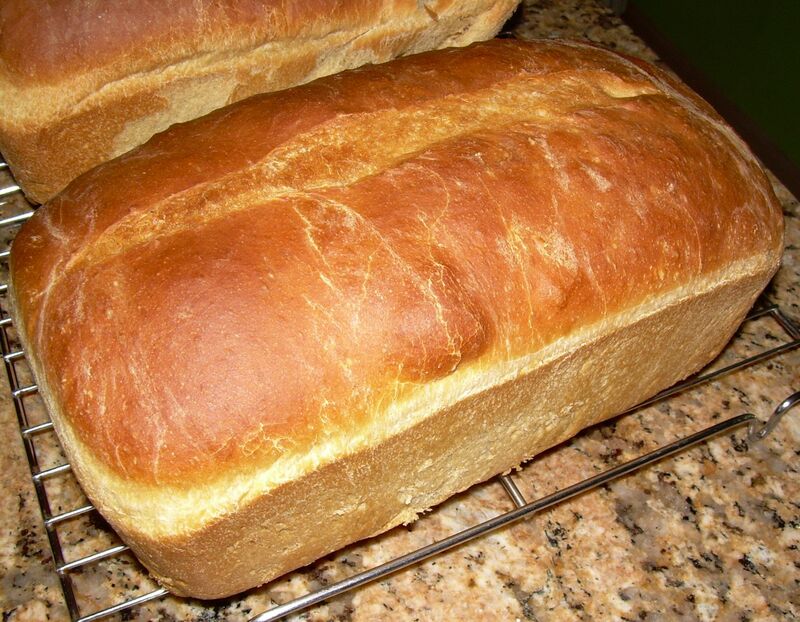 There’s nothing better than home-baked bread. This sounds delicious, and looks so perfect! I love the shine on this bread. Wow, lovely. Now you would think I would own that book wouldn’t you?! But by the looks of that wonderful looking loaf of bread I think I know what my next bread book is… Absolutely fantastic bread my friend! And the buttermilk still gives you the little zing that sourdough provides too. Beautiful bread. You have put another bread book on my wish list, you naughty lady! I have some buttermilk too, I should get baking. Sometimes it is nice to have something that doesn’t start with my rye sourdough starter. Your crust is so golden and perfect looking. Those loaves look great! I love making bread.. if only the yeast would work quicker..
Great looking loaves. I’d like to put in a plug for Beth’s The Bread Lover’s Bread Machine Cookbook. Now I know some don’t care for the machines but on a hot humid day for a smaller family …. I was gifted with an older garage sale find and this cookbook has so many breads to try. I just made Beth’s Buttermilk Whole Wheat Bread with KA white whole wheat flour with a slight adjustment. This recipe calls for a little canola oil and maple syrup. Came out just perfect. *Bookmarked! * Those perfectly golden-brown loaves look great. If it weren’t 11 pm now I would make them… seriously.